How OEA and NEA’s new system of online learning can transform your practice. High quality, on-demand professional learning that meets your professional needs. Learning you can apply in your classroom immediately, and helps you renew your license. Learning you can do with your colleagues in an authentic learning community. Oh, and that’s free, too. Micro-credentials also allow educators to show mastery of specific and discrete competencies and to receive recognition for this mastery. 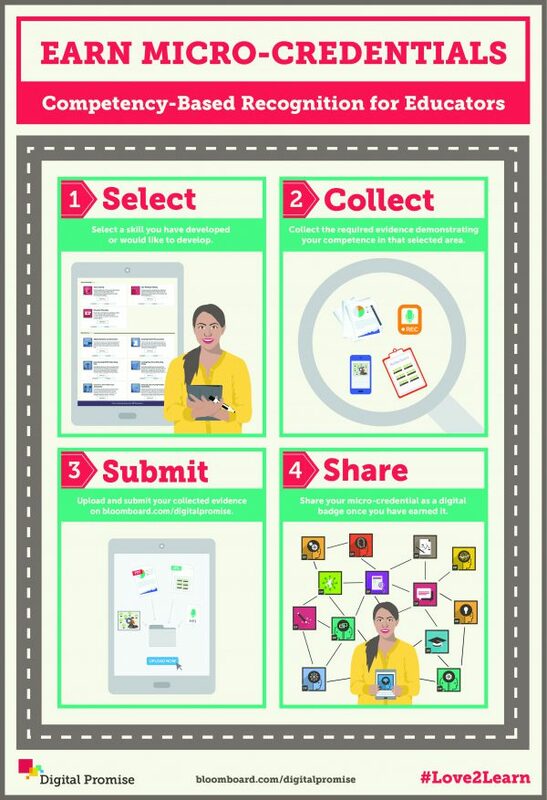 Once educators have demonstrated mastery, they are issued a digital badge. They can use this digital badge on their resumes, on social media profiles, and to earn professional development units (PDUs). NEA offers over 100 micro-credentials to educators free of charge. Many of the micro-credentials align with the Model Core Teaching Standards, the professional educator standards that Oregon’s evaluation system is based on. This means micro-credentials can also support your annual professional growth goals and be used as an artifact in Oregon’s evaluation system. All the micro-credentials NEA offers were written and developed by NEA members across the country. Additionally, NEA members review the submissions and provide direct feedback to educators. NEA plans to add additional micro-credentials over time. Click “Apply” when you are ready to start. After you receive your digital badge, submit it to oealearn@oregoned.org to receive a PDU certificate. Most micro-credentials take about 10 hours to complete, meaning you can earn 10 PDUs per micro-credential (on average). With more than 70 micro-credentials to choose from, you can earn all the PDUs you need to renew your license, free through your union. Any educator can complete a micro-credential individually. They are free to OEA and NEA members and you work through them at your own pace. Completing a micro-credential individually is just one way to engage in this kind of professional development. Another powerful way to use micro-credentials is to do them in a professional learning community, or PLC. Many school districts support formal PLCs in schools, and educators could use their time to collaborate on the micro-credential questions, lessons, and resources. Educators can also form informal PLCs with their colleagues from their school, local association, or other professional group. Advocating for release time to prepare micro-credential submissions. No matter the model, once you have earned a micro-credential, OEA will certify your learning with a PDU certificate you can use toward re-certification. OEA has recently launched an online learning management system, OEA Learn, at learn.oregoned.org. Coming in the 2018-19 school year, OEA will create opportunities for educators to complete micro-credentials within an online community of like-minded educators. OEA will be looking for members to help lead these communities. If you’re interested, contact oealearn@oregoned.org. Ideally, member leaders will have successfully completed a micro-credential and will then turn around and lead for other members. Or, if your local would like support in organizing a local micro-credential learning experience, OEA staff members can help through resources, support, introductory presentations, or organizing support. High quality, on-demand professional learning that meets your professional needs isn’t a dream anymore. It can be a reality through micro-credentials. Visit learn.oregoned.org to create your free micro-credential account and learn more today!